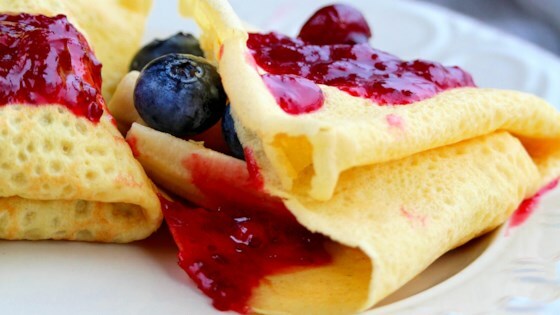 "Great tasting gluten-free crepe recipe. Works well every time." Whisk rice flour, eggs, almond milk, sugar, and salt together in a large bowl until well mixed. Combine water and 3 tablespoons coconut oil in a separate bowl until well blended. Whisk into the flour mixture. Pour batter through a sieve into a clean bowl; cover with plastic wrap and refrigerate for 1 hour. Heat remaining coconut oil in a griddle over medium heat. Ladle a portion of the batter into the pan and spread out. Cook until set, about 30 seconds per side. Repeat with the remaining batter. Coconut palm sugar may be used in place of the white sugar. Excellent! I made a half batch using two small eggs. Using one-quarter cup of batter, I got six, 9-inch crepes. Thank you for the recipe.